Things are going really well here and Golf Nations. To date we’ve signed 17 AGAs, which represents approximately 42 percent of the marketplace. With the addition of Texas to our full suite, the product is expanding rapidly. We’ve established true sustainability, and AGAs are really starting to see the benefits of coming together. On that note, it’s time for an update on our recent releases. With our CRM launched, we’re refining our segmentation tools to help you get the most ROI from your data. 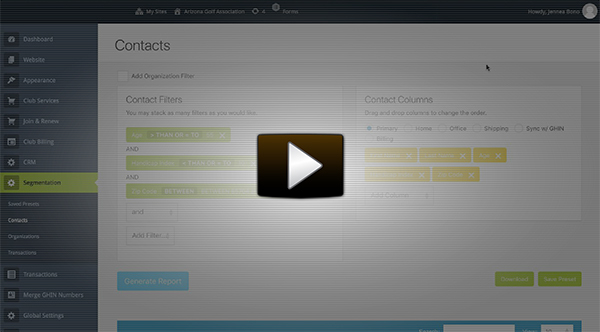 When you use the Golf Nations suite, you’re connecting to one, centralized database, which gives you the ability to create reports in ways you’ve never been able to before. Let’s say you want to pull all members who are 55 or older, with a Handicap Index of 10 or less, who live in a specific range of zip codes. Now let’s get a bit more complex. Let’s add an organization filter to it (oh yes, you can do that!). Let’s search only for golfers who are members of clubs that are located in a specific zip code. Your segmented list is now even more refined, giving you the ability to precisely target a subsection of your members. Whether you need the info for a board presentation, or your marketers want to target a subset of your membership, or you’re looking to send emails to those who might be interested in an upcoming tournament, our CRM segmentation tools are sure to simplify your workload. Our Club Billing system now includes renewal and lapsed email notifications to help you retain members year-over-year. When you turn this feature on, your Golf Nations site will automatically send three renewal notifications and two lapsed notifications, based on the a customized timeline you set. Why is this so awesome? Because now you have the ability to send personalized, targeted emails to your members based on their renewal activity. You can include things like the member’s subscription end date as well as a renewal link that takes them straight to the renewal page for their club. The best part is, once the member renews he or she won’t receive any additional renewal/lapsed emails from you. You’re no longer bothering members who have renewed with a generic “renew now” email sent to your entire membership base. When you send targeted emails to your members, they’re much more likely to engage with the emails you send. By the way, if a club prefers you don’t bother their members you can easily turn off notifications on a club by club basis. We’re excited to announce we’ve launched My Clubhouse and have one association already using it for their website: Greater Cincinnati Golf Association. My Clubhouse includes lots of useful features like an easy-to-use content management system, news sliders, a robust form builder, blogging tools, a course directory, asset management, and a social media wall. Creating beautifully designed web pages has never been easier. Check it out! We’re busy developing even more awesome Golf Nations product enhancements. Stay tuned for our next product release update. Oh, and if you’re not using our full suite but would like to learn more about the features available in it, contact Miki.